Tropical Storm Olivia is making its slow advance through the Hawaiian Islands today, with the current onset of high winds and heavy rainfall on Maui County and Oahu being the biggest threats to people and property. Over the past 36 hours, Olivia has proven to be erratic and unpredictable as it nears the Hawaiian Islands. 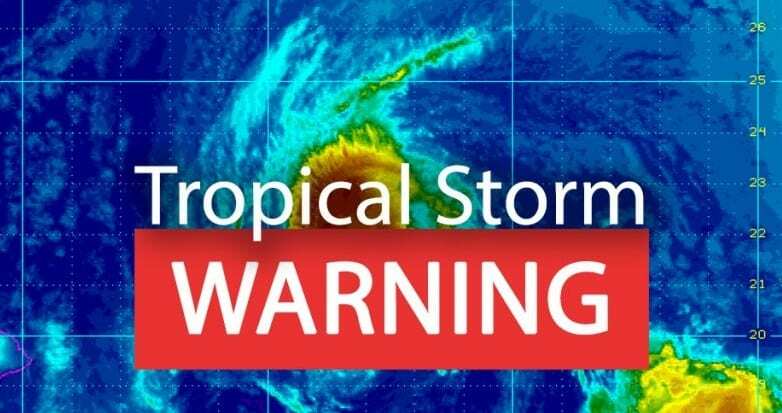 With the storm’s latest shift in direction overnight toward Maui County and Oahu, the National Weather Service has canceled the tropical storm warning for the island of Hawaii and Kauai. All of the Hawaiian Islands continue to be under a flash flood watch through Thursday, meaning conditions are favorable for flash flooding in flood-prone areas. As such, state and county civil defense officials are strongly encouraging all residents and visitors statewide to continue monitoring Olivia and its impacts on the weather until the storm has completed its pass of the islands. According to the Central Pacific Hurricane Center, as of 11:00 a.m. HST, Olivia had maximum sustained winds of 45 miles per hour and was moving west at 15 miles per hour. The center of Olivia, where tropical force winds and rainfall are at their strongest, was located 40 miles west of Kahului on Maui and 60 miles east-southeast of Honolulu on Oahu. High winds of 30 to 45 miles per hour, with gusts up to 65 miles per hour, are possible throughout today on Maui County and Oahu. In addition, total rainfall of 5 to 10 inches, with isolated areas receiving up to 15 inches, is possible. The National Weather Service cautions the heaviest rainfall could continue for 6 to 12 hours after the high winds subside. Residents and visitors of Maui County and Oahu are advised to shelter in place and have access to an adequate supply of food, water, medications and essential goods until Olivia completes its pass. For visitors currently in Hawaii or with confirmed trips to anywhere in the Hawaiian Islands in the coming weeks, HTA advises them to stay informed about Olivia and to contact their airlines, accommodations and activity providers to see if adjustments to travel plans are needed. To help keep residents and visitors informed, HTA has a special Alert page about Olivia on its website and is posting updates as new information becomes available. Included are links to resources for weather information, alerts posted by the State of Hawaii and four island counties, closures of parks, airline travel waivers, and news releases pertinent to Olivia. Following are links to resources about Olivia, being prepared for its onset, and coping with weather impacts.